Who said that I wonder? A quick and dirty Google search tells me that it is attributed to Frederick R. Barnard who published a piece in 1921, commending the effectiveness of graphics in advertising. Imagine what he would have to say in this connected multimedia world. 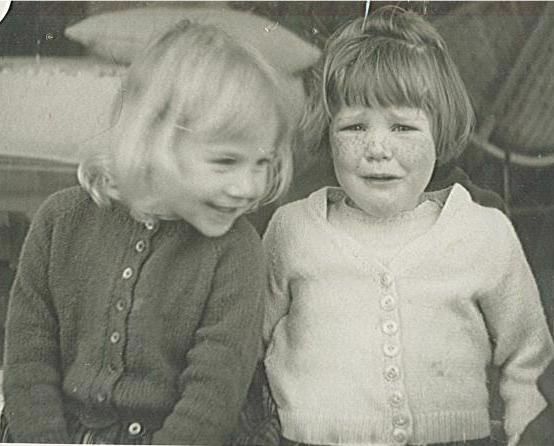 This is a picture of me and a friend at the age of about three. I am the one crying. The other cherub is clearly enjoying the moment. I remember this incident and why I was crying. I didn’t want my photo taken. I didn’t know what having my “photo taken” meant. I didn’t like being forced to have this done. The photographer was the father of the happy girl, our neighbour, a school principal, and a huge bear of a man, of whom I was frightened. So it was a traumatic experience for me as a small child and I remember it well. I have never liked having my photo taken since. I am not photogenic, nor fit the popular notion of what is attractive. So I don’t take many #selfies. And I don’t often post them to social media. I prefer to be at the other end of the camera lens. On Instagram I am @queuingforbliss. This nom de plume originated in my pursuit to find beauty in my life. This began with a blog I created titled French Accent where I was trying to define what that pursuit for beauty really meant for me. It led to a trip to Europe in 2008 with my husband. We would queue gladly and expectantly to see master works of art and architecture: Michelangelo’s Statue of David in Florence Italy; Leonardo Da Vinci’s Mona Lisa at Le Louvre in Paris; the Sistine Chapel at the Vatican in Rome; Le Tour Eiffel; and much much more. And I remember sitting in the town square in Beaune France cocooned in a cloud of bliss, feeling like I was in love, realising I had indeed found my bliss. Back in Australia the challenge for me has always been to find that je ne sais quoi here at home. My quest is a daily one that persists. Instagram helps. I love Instagram. I love the immediacy of being able to see moments around our world as they happen and through the eyes of others. I appreciate the transient nature of this experience. There is no need to archive. I love that it represents a snapshot of our world moment by moment and we get to share that with everyone. I don’t see the point of locking down this social media tool as a private domain. The joy is in the shared experience. I have always responded well to visual stimulation. Like many people I love colour and beauty. I love this Earth. I love detail, patterns, texture, art, landscapes, still-life images, shapes, and design. I don’t mind if the image has been enhanced with filters or other software applications. The detail is in the eye of the creator of the image, and if it is an image that stimulates further artistic creativity, then that is a perfectly reasonable aspect of this creative stimulation that Instagram inspires. Some people have a natural eye for detail and capture excellent snapshots. Others have a gift for photography and some earn a living as photographers and it is good to see those on Instagram too. And while I enjoy following National Geographic @natgeo, @nasa and other organisations, it is the everyperson daily snaps that seem to carry the most interest for me. I don’t like sales on Instagram or personal promotion, and if it is a key component of the content then I will unfollow that person. Instagram offers food for the soul. This entry was posted in Uncategorized and tagged apps, beauty, creativity, inspiration, Instagram, photography, photos, social networking by suesbent. Bookmark the permalink.